Next time you get your teeth checked out, think of Sandy Lyle. "The only way I can explain it to people is if you were at the dentist," the man himself began. "You're in the waiting room and you've got this horrible sort of churning feeling in your stomach. "You don't know if it's going to be a pleasurable experience or a painful experience. "That's what it's like when you're going into the last day with a one or two-shot lead." On Sunday 10 April 1988, the Scottish golfer had such a lead after the front nine at Augusta's prestigious Masters tournament. All Lyle's prayers seemed to be answered as he turned Amen Corner. But a horrible combination of bogeys and jitters saw him tied for the lead with American Mark Calcavecchia on the 18th tee. And an over-indulgent drive down the fairway there and into a bunker moved him from waiting room to dentist's chair. 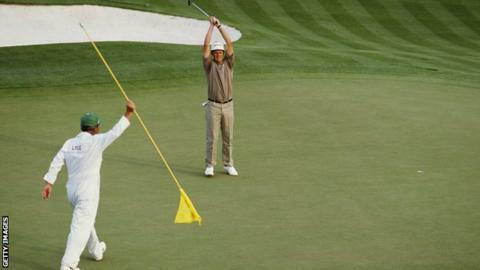 However, what happened next has been described as the best shot in a major golf championship. Lyle's weapon of choice was a seven iron and a tremendous shot, given the pressured circumstances, took him to within 15 feet of the pin. He subsequently sank the challenging putt and secured a one-stroke victory. "I think you could call it a jig, yes," he told BBC Scotland. "I wanted to do a somersault more than anything else but my legs had gone completely. "The hotel where I was staying was noisy with a disco room and a bar going on virtually every night of that week. "I thought 'this is a good time to celebrate, I'm going to go down with the Green Jacket on as it's time to relax and have a bit of a party'. "But on Sunday night everyone had gone home - there's no disco and nobody in the bar. So I walk into this place going 'where is everybody?' - and there's nothing!" Almost 25 years to the day later, that can be put right, as Lyle collects a Lifetime Achievement Award at the 2013 Scottish Golf Awards. "Great" - defined as "an extent, amount or intensity considerably above the normal or average" - is an adjective bandied about pretty loosely these days. But in terms of winning majors, the 55-year-old can deservedly be described as Scotland's greatest modern-day golfer. For in addition to becoming the first Briton to wear the Green Jacket, the man once described by Seve Ballesteros as the best around also triumphed in The Open, three years prior to his Augusta win. "You're not judged as a great player unless you've won a major of some sort," explained Lyle. "So to get the first one reasonably early, in 1985, did help me an awful lot. "To win The Open championship is a great achievement and something I'd always wanted to do. "Then you win overseas in America, with the Green Jacket and all the razzmatazz that goes with it, to be my second major - I've never forgotten that. "I get reminded of it by people I play golf with nearly every week. To them it's just like it happened a few weeks ago even though it's 25 years. "When I die in my bed I'll be a very, very happy man that I've had some good memories." But surely, for a man who turned professional in 1977 and had topped the European Tour Order of Merit two years later, more majors should have followed post-1988? "I was playing two Tours," he reflected. "That probably hindered me more than anything else, as far as performances go, because I was getting tired. "That was the downfall in the early 1990s for me - sheer exhaustion. "Plus, because your performance is dropping down, you try and change things to make it better and I've almost been in a sort of spin ever since and never really got out of it. "You get mentally depressed because you're losing sponsorship, not making as much money, because you're not up near the top three or four and then all of a sudden you're missing cuts, sometimes eight or nine cuts in a row." A stark tale of how one admirer of this beautiful game of golf found out she can play hard to get. But you can't help feeling this five-time Ryder Cup team member has more still to give. And perhaps it could be in that very tournament. Irishman Paul McGinley emerged as first choice to captain the European team for 2014's event at Gleneagles, but Lyle's name had been mentioned in despatches. "If Paul wants a translator I can help him out quite easily!" he joked. "I've obviously been thought about many times and you never lose hope. I think there's still a window of time there where it could happen. To be involved, pass on your experiences and help out would be great. "But I'm never bitter about it because I've had my five years in the competitive side of it. "It might just be a little hitch in my career, that I've had Masters wins and stuff but never been Ryder Cup captain. "But it's not the end of the world."